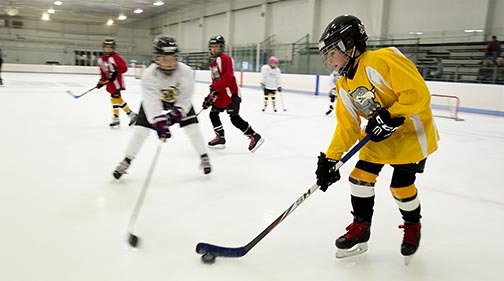 The Cambridge Hometown Hockey League (CHHL) was developed to bridge the gap between instructional and travel hockey for Mite and Squirt age players. CHHL provides two practices per week (Monday and Saturday), with an option for a third practice. Saturdays will also include games. The games will be non-contact cross- or half-ice, creating a strong learning environment for novice as well as newly established players. While we will play most of our games within the CHHL, some travel to nearby towns may be incorporated into the schedule (if the opportunity arises). Travel will be limited to nearby rinks and we will try to keep the schedule consistent. The program is coached by CYH volunteers who bring a variety of hockey experience to the CHHL. The two main objectives of the CHHL will be learning and fun! Cost: $675 + $48 USA Hockey registration fee (free for those 6 and under). To obtain a USA Hockey registration number click here. If you are interested in volunteering for this program please contact the Jon Come, CYH President at president@cambridgeyouthhockey.org.